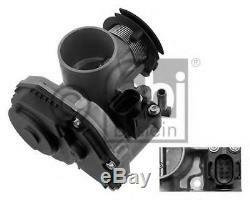 Throttle body for SEAT, VW, SKODA IBIZA II, 6K1, ABU, AEE, ALM, ABD, AEX, AKV, APQ, AER, ANX. Use engines info and vehicle YMM compatibility chart for general guide. To avoid any kind of misfitment, when you doubt in compatibility, or cannot find the correct item, please, contact Asvela tech support before purchasing. Strictly important to provide VIN along with your detailed request since there can be different options for your car specific tech characteristics. The VIN a 17-character number (digits and capital letters)can be found by looking at the dashboard on the driver's side of the vehicle or on the driver's side door and look at the door post. 6K1 6K2 6H 6K5 1M1 1M2 6N1 6KV2 1J1 6X1 6E1 6KV5 1J2 1J5 1U2 1U5 ABU AEE ALM ABD AEX AKV APQ AER ANX ANV ALD AUC ALL ANW AKK AUD AHW AXP APE AUA BCA AHS AEA AKQ SEAT 030 133 064 F 30 133 064 F SKODA VW ACEMARK 341378 ACI-AVESA ACM003 AUTEX 961043 AUTOMEGA 1300538 130053810 BUGIAD BSP22688 DIPASPORT FLAI074R ELTAAUTOMOTIVE XFP8626 XTB9706 ERA 556104 ESEN SKV 12SKV015 FEBI BILSTEIN 44944 FISPA 88004 HOFFER 7519004 IPD 460038 JP GROUP 1115400200 LUCAS ELECTRICAL FDB1491 LTH407 MAXGEAR 580042 MEAT & DORIA 89004 METZGER 0892100 OSSCA 04660 4660 PATRON PTH021 PIERBURG 703703020 A178352A 703703360 QUINTON HAZELL XPOT444 S. T STANDARD 68204 KTB005 LTB009 TB3009 SWAG 30944944 TRISCAN 882029012 VAG 030133064F VDO 408237130004Z VEMO V10810001 V108100011. If you see that the package that courier tries to deliver is damaged, please fill up the claim form or do not accept it. NOTIFY US right away, we will arrange a replacement/reimburse your order A. Items that are sent in vacum or lubricated film cannot be opened if the retuns is issued. Please let us to know if you have not received our feedback, we will give feedback manually. The item "Throttle body for SEAT, VW, SKODA IBIZA II, 6K1, ABU, AEE, ALM, ABD, AEX, AKV, APQ, AER, ANX" is in sale since Tuesday, June 5, 2018. This item is in the category "Vehicle Parts & Accessories\Car Parts\Other Car Parts". The seller is "asvela1995" and is located in Vilnius. This item can be shipped worldwide.